3D4 Checkers:TM Coming Soon !! A 3 dimensional, 4 player, checkers game. A 3 dimensional game that can be played on a 2 dimensional plane. 3D4 Checkers:TM is played by 4 players. Ages to play “3D4 Checkers:TM “ are 12 to adult. Play time for 3D4 Checkers:TM is 30 to 45 minutes. The solid Black squares:A player’s piece (any piece) may not land on or travel through any solid black square, or the connecting corners, any time during the game. The BLACK squares are out of bounds.These black squares are part of the game board design. 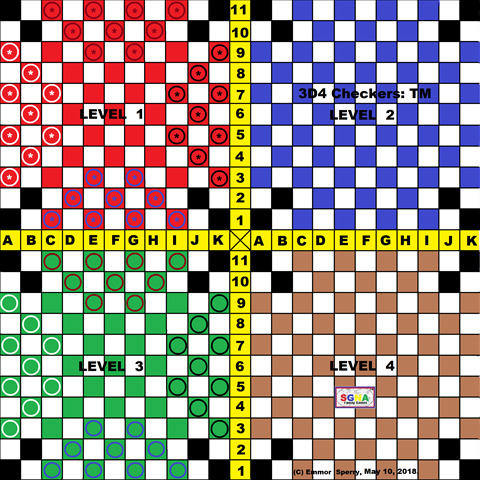 3D4 Checkers:TM , game board consists of 4 sections and each section consists of 121 squares totalling 484 squares and 3D4 Checkers:TM game board consists of 4 sections and each section is a different level. Each level consists of 121 squares, a single plane/level is 11 squares wide by 11 squares long. The 4 different plane/section levels are all exactly the same design and in a three dimensional design could be stacked on top of each other with all the sides being parallel. The distance between levels is about 6 inches. All the squares are alternately colored as with a standard Checker board game. Level #1 is the top level and Level #4 is the bottom level. 9 checkers with an asterisk and 9 plain checkers. 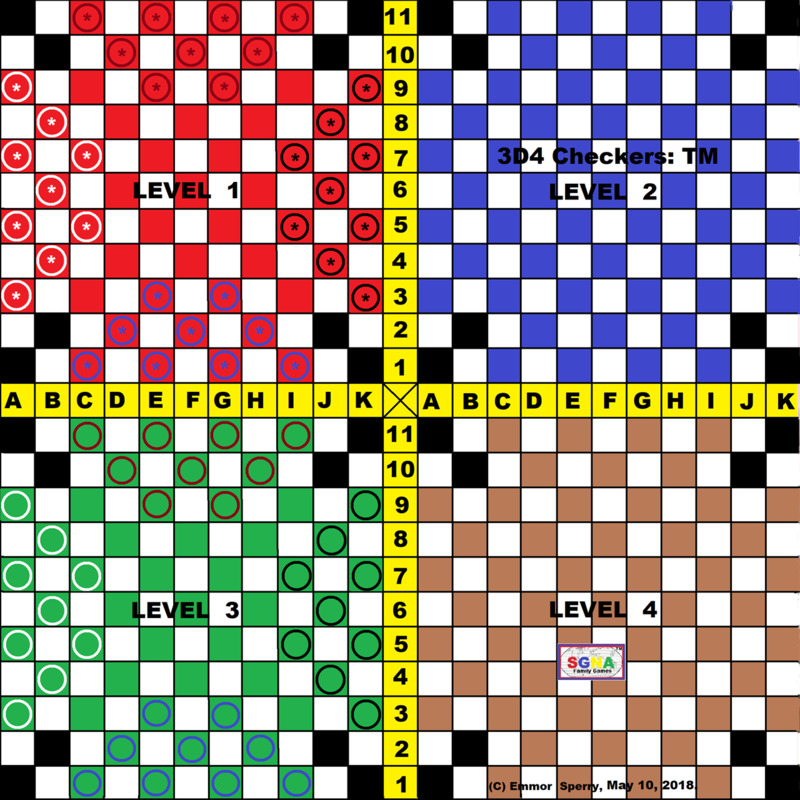 Level 1 and level 3 are set up with game checkers, in exactly the same way as per the symbol squares at the start of a game. Each of the four players starts out with 18 playing pieces (checkers) 9 with an asterisk in the center and 9 that are plain. One player has RED colored pieces and another has GREEN pieces, another player has BROWN pieces and another player has BLACK. Each player starts with their 18 pieces laid out on the symbol squares on sectional levels 1 & 3. First place the playing board on a table, the players sit on 4 sides. Each player picks a color of playing checkers to represent him on the playing board. The players then place their game pieces on the symbol squares to start the game. Red moves first. The player with the RED pieces moves first. Randomly determine who gets the RED pieces first. Use a coin toss. Play then moves to the right. When a player’s hand & fingers are withdrawn from the board, the move is ended. The checkers and Kings can only move diagonally on a single plain or up & down diagonally one square at a time; unless making a jump. Jumps are not mandatory. In the case where there are different jump sequences available, the player may chose which jump or of jump sequence to make, whether it results in the most pieces being taken or not. When a piece is jumped it is removed from the playing board. A player can not jump his own pieces. In 3D4 Checkers:TM, captures/jumps are not compulsory. In 3D4 Checkers:TM a jump must be made only over an opponents adjacent diagonally positioned piece on the same level or adjacent diagonally one of the other levels. (*A) Jumping up or down, must finish on the level where the checker started. the move can not interrupt any other checkers or kings; the checker or king must be in clear squares from the start of a checker jump to the end. Checkers cannot jump backwards; kings can. A player may make a sequence [2,3 or more checkers] of jumps on one move and the checkers may be of 1 or more opponents checkers, but procedure must follow (*A). A player can not jump his own checker. Checkers can only move forward (or up & down) or jump in a forward diagonally direction (or up & down) until they become kings then they can move in any direction. Single pieces can only move in a forward direction. Kings—to become a KING checker; a players checker must move to (land on) the opposite side of the home base section level and it must land on the line of squares that starts with 4 checkers. On landing on this line of squares the checker becomes a king. A king is allowed to move or jump in any of the four diagonal directions on a single level or up & down within the limits of the board. A king cannot jump over one of the player’s own checkers. A checker can not jump a king; but a king can jump other kings or a checkers. Jumped checkers and Kings must be removed from the board. A player does not loose a piece, for not jumping. A sectional margin divides the sections, both horizontally and vertically within this margin the rows of playing squares are numbered and/or lettered. Numbered vertically 1 to 11 for each section and horizontally lettered A to K for each section ; this margin becomes part of the game board. 3--the last player to have checkers on the board wins. 4--If a player has pieces put into a position where the other player does not have the ability to move, then that player is out of the game. 5--A player can also win if the other players resign or forfeit the game as a result of a violation of the rules. 6-- A game is declared a draw when two or more players are left in play and none of the players can force a win. 3D4 Checkers:TM: Copyright by EMMOR RAY SPERRY, MAY 10,2018. The distinctive design of “3D4 Checkers:TM” and the words “3D4 Checkers:TM” are Trademarks of EMMOR RAY SPERRY. All rights reserved. Any infringement on these copyrights or these Trademarks, in whole or in part, by any means, without written permission from EMMOR RAY SPERRY is strictly prohibited. U.S.A. Copyright number TXu002098325 . games and toys. It needs some touch up work from a professional graphic artist and perhaps add cities, geological features, and countries. 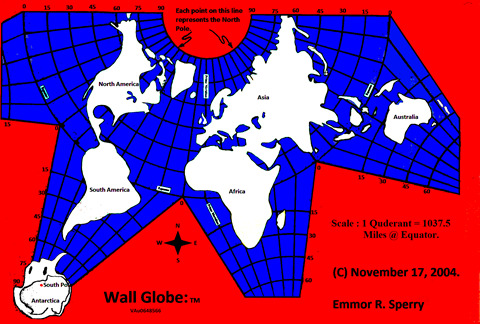 Perhaps add some world trivia to the map projection. A 36 inch by 36 inch paper map can be manufactured for about $1.00 and retail for $8 to $10. Coming Soon. In 2016 and the years of global positioning and Goggle Earth a new world map is only about 200 years late. [Ha-ha] This world map projection would have been a real hit in 1850.